The first generation of U.S. photo intelligence satellites collected more than 860,000 images of the Earth’s surface between 1960 and 1972. The classified military satellite systems code-named CORONA, ARGON, and LANYARD acquired photographic images from space and returned the film to Earth for processing and analysis. 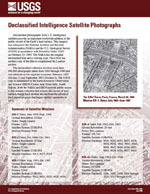 The images were originally used for reconnaissance and to produce maps for U.S. intelligence agencies. In 1992, an Environmental Task Force evaluated the application of early satellite data for environmental studies. Since the CORONA, ARGON, and LANYARD data were no longer critical to national security and could be of historical value for global change research, the images were declassified by Executive Order 12951 in 1995. The first successful CORONA mission was launched from Vandenberg Air Force Base in 1960. The satellite acquired photographs with a telescopic camera system and loaded the exposed film into recovery capsules. The capsules or buckets were de-orbited and retrieved by aircraft while the capsules parachuted to earth. The exposed film was developed and the images were analyzed for a range of military applications. The intelligence community used Keyhole (KH) designators to describe system characteristics and accomplishments. The CORONA systems were designated KH-1, KH-2, KH-3, KH-4, KH-4A, and KH-4B. The ARGON systems used the designator KH-5 and the LANYARD systems used KH-6. Mission numbers were a means for indexing the imagery and associated collateral data. A variety of camera systems were used with the satellites. Early systems (KH-1, KH-2, KH-3, and KH-6) carried a single panoramic camera or a single frame camera (KH-5). The later systems (KH-4, KH-4A, and KH-4B) carried two panoramic cameras with a separation angle of 30° with one camera looking forward and the other looking aft. The original film and technical mission-related documents are maintained by the National Archives and Records Administration (NARA). Duplicate film sources held in the USGS EROS Center archive are used to produce digital copies of the imagery. Mathematical calculations based on camera operation and satellite path were used to approximate image coordinates. Since the accuracy of the coordinates varies according to the precision of information used for the derivation, users should inspect the preview image to verify that the area of interest is contained in the selected frame. Users should also note that the images have not been georeferenced. High performance photogrammetric film scanners are used to create digital products at 7-micron (3,600 dpi) or 14-micron (1,800 dpi) resolution. On-demand scanning is available for this black-and-white collection for $30.00 per frame. The actual file size may vary due to image data, surrounding metadata, and the addition of the USGS logo. Coverage Maps indicating the availability of Corona 2 products are available for download. EarthExplorer can be used to search, preview, and download existing digital files at no cost. For all other imagery, an order will need to be placed to scan the film at $30.00 per frame. The collection is located under the Declassified Data category as Declass 1. Images should always be previewed online before placing an order to verify area of interest and to check for cloud cover.